Truffles have been called “diamonds of the kitchen” because of the exquisite earthy taste they bring to food. I wouldn’t be surprised if it was also due to their incredible cost. There are two types, black and white, and the latter have sold for as much as $3,600 a pound. At a charity auction in 2010 a Macau billionaire paid $330,000 for about 2.8 pounds of them. They are the most expensive food in the world. 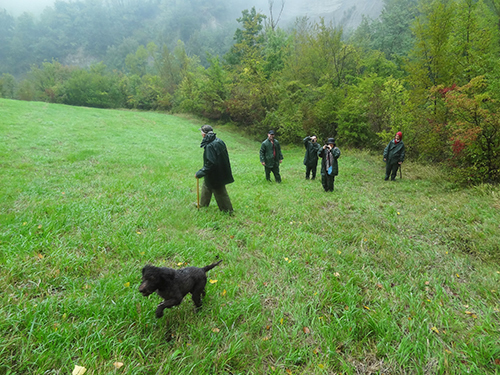 I’d always wanted to go on a truffle hunt and while training about Europe a few months ago, decided I’d finally do it. Since I was going to visit to Bologna, I thought what better place to learn about truffles then in the food mecca of Italy. 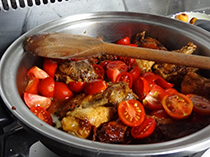 I had earlier learned of Bluone Cooking Tours, a small family-run company in Bologna, through an article in The New York Times. 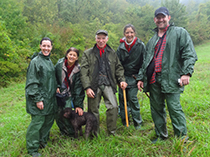 I contacted them and found that in addition to cooking tours they also had a truffle-hunting tour, followed by a cooking demonstration and lunch in a farm home. I knew I was in heaven as I headed straight for Italy’s foodie mecca. Marcello Bluone asked that I meet his wife Raffaella and two Australian tourists at a hotel near Bologna’s Piazza Maggiore a bit before eight o’clock the morning of the hunt. When I got there the weather had turned rainy, although it hadn’t dampen our spirits. In Raffaella’s car we set out for the hills outside the city. En route Raffaella stopped at a farmer’s supply store where we purchased some inexpensive rain jackets, pants and boots and were then joined by Raffaella’s daughter Francesca. 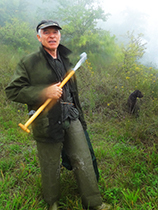 Then it was back into the car and off to meet Silvano Montefiore, our hunter, and Spino, who would be doing all the work. Spino was a Lagotto, a small wiry dog that looks somewhat like a poodle. 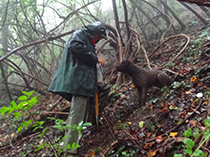 It’s regarded as the official truffle hound, although many dogs can be taught to do the dirty work. After driving through the fog and rain on winding roads through the hills, we arrived at the spot where Spino was to hunt. Once out of his cage in the back of Silvano’s car he was a bundle of energy. We walked down the road a little bit and turned onto a dirt and gravel road that ran down into the woods where we came to a meadow. Once unleashed Spiro immediately began running all over, poking his head into the woods while the rain continued and fog drifted in, softening the scenery and giving the entire scene an almost ethereal look. We followed Silvano into the muddy woods, he carrying his vanghetto, a cross between a little hoe and spear that’s used for digging up the little tuber-like tartufi. Every once in a while going down a little slope we’d have to grab a small branch or sapling to prevent slipping on the muddy ground. We walked on, all of us with our cameras at the ready awaiting the moment when Spino would unearth a truffle. Since they grow entirely underground with no shoots or leaves hinting at their presence, they’re very hard to find except by a trained dog or pig (although pigs are rarely used any longer since they tend to eat the truffle as soon as it’s found). I watched in amazement as Spino continued running about frenetically with his nose to the ground, flitting in and out of the undergrowth, so fast at times he was almost a blur with his brown fur blending with the muddy earth. After about a half-hour he started digging furiously near a tangle of vines and small trees and pulled a mud-covered truffle from the soil. He exchanged it with Silvano for a treat as we all gathered around to view it. It was a black truffle, quite irregular in shape and about two inches in length. It was Spino’s only find of the day, which in hindsight was probably fortunate since we were all a bit wet and we needed to get on to the Gianna’s farmhouse for the cooking demonstration and lunch. We arrived at the farmhouse quite a bit late because a traffic accident forced us to make a lengthy detour. When we arrived Gianna was rolling out dough on a large piece of plywood with a very large rolling pin. We all found it incredible how thin she had rolled the dough out, so thin that you see the grain of the wood through the pasta. You could tell this was a woman who was serious about her food. In addition to the cooking demonstrations at the farm Gianna and her family also make a special olive oil that has a unique taste due, we were told, to the trees growing in a cooler climate. They also make their own wine, which we later found was quite good. 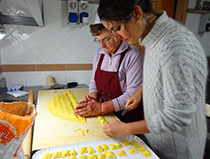 The three of us watched as Gianna made her little raviolis, which we subsequently had for lunch along with a frittata and a bruschetta with fresh truffles. She had grated her tartufi and mixed it with salt and pepper and her special olive oil. It was delicious. We arrived back in Bologna in late afternoon but for me that wasn’t to be the end of it. The next morning I joined Raffaella again as she took me along with another couple on a tour of Bologna’s old food markets. That was a fascinating tour, as well, as we went from store to store, market stall to market stall, as she explained the importance of all the different pasta, vegetables, meats and fish to the Bolognese palette. Raffaella stopped and shopped as we walked along and she asked me to join the three of them for a home-cooked Bolognese meal that afternoon. It was so deliciously tempting, but I couldn’t join them because there were other people I needed to meet since I was leaving the next morning. What an opportunity to have to miss, I thought. Damn.